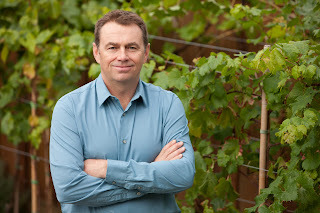 Burrowing Owl Estate Winery is among the several Okanagan wineries using the services of Alain Sutre, one of the leading winemaking and viticultural consultants in Bordeaux. His instructions are simple, according to Burrowing Owl president Chris Wyse. “Your job is to focus on the Meritage – and it will trickle down on all the other wines,” Chris has told Alain. The consultant’s activities extend to vineyard advice but one of his key roles is leading the blending of the Meritage, the flagship red at Burrowing Owl. Alain’s handiwork was on display during a Wine Festival dinner this week where Burrowing Owl’s Bordeaux red wines were paired with the excellent Italian-inspired cuisine at Lupo Restaurant and Vinoteca in Vancouver. 1. The bold flavours of Burrowing Owl wines stand up very well with the rich flavours of Italian cuisine. That comment extends even to 2009 Chardonnay – crisp citrus flavours with a note of toasty oak – which paired brilliantly with an exceptional dish (even in appearance, never mind taste), an octopus carpaccio and Dungeness crab salad. The reds accompanied subsequent courses – tortellini, veal tenderloin and finally a rich chocolate dessert from Piedmont. Burrowing Owl’s 2008 Cabernet Franc struggled a bit against the chocolate. A more successful match would have been the dessert and Burrowing Owl’s new Syrah-based port, a wine called Coruja, which was served with biscotti. The Coruja – the price is unknown because it is not on the winery’s website yet – has the full-bodied depth and richness of a good vintage port with a long finish of spice and black liquorice. 2. It is time to begin drinking the 2006 Burrowing Owl reds you may be cellaring. For the dinner, the winery dipped into its library for wines from 2006, one of the strongest vintages of the decade, and from 2008, another solid vintage. The wines were Merlot, Cabernet Sauvignon and Meritage; only the 2008 Cabernet Franc was poured. It seems to my palate that the 2006 reds have achieved a peak and will probably hold it for a year or two. That is supported by vintage notes on the winery’s website – and they should know. The 2008s are drinking very well already, with peaking a year or two away. They have the structure to hold that peak for several years. 3. The Meritage, which at $45 sells for a $15 premium compared with the varietals, is a very good wine indeed. If it came from one of those classified growths in Alain’s Bordeaux, it would be selling for three to four times that and the wine critics would still think it a deal. The fact is that quality Okanagan wines, and this is one, are very good value compared with the big names from elsewhere in the world – even cheap. Burrowing Owl’s Meritage involves all five Bordeaux varietals. The blend in the 2006 is 53.8% Merlot, 27.5% Cabernet Franc, 12.5% Cabernet Sauvignon, 3,7% Malbec and 2.5% Petit Verdot. The blend in the 2008 was 50% Merlot, 24% each Cabernet Franc and Cabernet Sauvignon and 1% each Malbec and Petit Verdot. My advice on this wine is the same as above: drink the 2006 and dip into the 2008 next year. The Vancouver Playhouse International Wine Festival, which begins on February 26, is always the year’s most intense week of wine tasting and wine dinners. The three nights international tastings – March 1, 2 and 3 – at the convention centre can be challenging. There will be about 750 wines available for tasting. Most people that I know will be lucky to manage 50 wines over each three-hour session. It helps to have a battle plan in mind when entering the tasting room. Here are some suggestions that may help focus. Chile: This is the theme region this year, with 35 producers attending. This is a critical festival for Chile, whose sales in this market seemed to have levelled off around $44 million a year for several years. One reason is probably that Argentina has been eating into Chile’s market share. But that should not be happening because the wines of Chile also are reasonably priced and good quality. Each country has its strengths. While Argentina excels with Torrontes and Malbec, Chile produces better Cabernet Sauvignon, Carmenère, Syrah, Sauvignon Blanc and Pinot Noir. Your Chilean tasting priority should include visits to the tables of Anakena (for Viognier); Concho y Toro (if only for the $80 Don Melchor, an iconic red); Cousiño-Macul (of the Chile’s oldest Cabernet producers); Cremaschi Furlotti (full-flavoured wines); Viña Errazuriz (for the $90 Don Maximiano, another icon); Viña Montes (a super premium winery); and Lapostelle, (the Grand Marnier-owned winery showing, among other products, a $100 red). Argentina: There are 14 producers here from Argentina. The wines from that country have been absolutely on fire in this market, with sales tripling in the past five years. Last year, with sales of $45.4 million in British Columbia, Argentina pulled ahead of Chile in this market. Since you haven’t time to taste at all of their tables, let me suggest a few bucket list priorities. Bodegas Catena Zapata is pouring, among other wines, a $54 Malbec 2008. Compare it with O. Fournier’s Alfa Crux Malbec 2008, at $50. Bodegas Pascual Toso is pouring a $58 red blend, Finca Pedregal, while Familia Zuccardi has a $50 red blend, Zuccardi Zeta. The point of seeking out the four most expensive Argentine reds is this: these producers already blow the socks off with their $15 wines; imagine how good the ultra-premium wines will be. There is a lot resting on the shoulders of the 17 Australian wineries here. It looks like everybody has been eating Australia’s lunch. Sales of Australian wine totaled $97 million last year, down from $131 million five years ago. Australia’s problem is the consumer perception that Australian wines all taste the same, due to the dominance of one or two huge brands. Here’s a chance to compare and discover that the perception is simply not true. Check out Chapel Hill for its Bush Vine Grenache; Jacob’s Creek for its St. Hugo Cabernet Sauvignon; Penfold’s for its Bin 128 Shiraz (alas, no Grange); Wirra Wirra Vineyards for three solid reds and an intriguing white blend; and Yalumba for Viognier. Ask the people behind the Yalumba table for the story of how this Australian winery virtually rescued Viognier when the variety was on the brink of extinction. 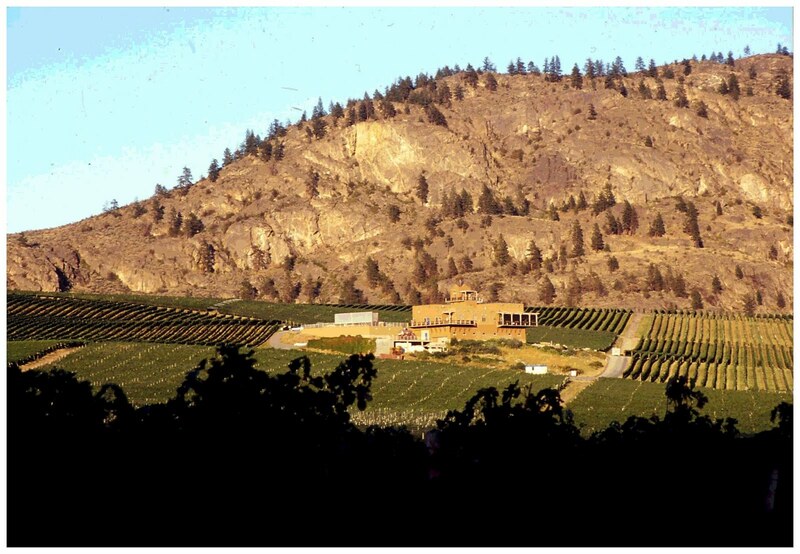 British Columbia: There are 20 British Columbia wineries including one that is new to the festival: Baillie-Grohman Estate Winery, one of three wineries now operating in Creston. The winery’s strong suites are Pinot Noir and Pinot Gris, wines that are well made by Dan Barker, a winemaker who comes up from New Zealand to do the vintage. Other wineries to check out include Burrowing Owl for its delicious Athene, a Cabernet/Syrah blend; Hester Creek for its new up-market red, The Judge; Le Vieux Pin and LaStella for their powerful reds; Mission Hill for Perpetua, a very elegant Chardonnay; Painted Rock (a winery of the year runner up at the Canadian Wine Awards) for a taste of the winery’s flagship Red Icon blend; Poplar Grove for its flagship The Legacy red; and Quails’ Gate for the Stewart Family Chardonnay and Stewart Family Pinot Noir. France: The dozen French wineries this year are heavily weighted to Rhône producers; and there is nothing wrong with that. One in particular that I plan to check out is Domaine de la Solitude which is offering, among other wines, a Châteauneuf du Pape at $250 a bottle and another at $128. But there is very little Champagne this year, sadly. Italy: The 15 Italian wineries this year include such old favourites in this market as Antinori, Frescobaldi and Masi. The latter winery is one of the great producers of Amarone. If you are comparing again, Amarone wines also are being shown by Pasqua and Tomassi. United States: By my count, there are 29 American wineries in the festival, enough for a second theme region; Chile will not be happy. The entries include all the familiar California wineries – Beringer, Caymus, Kendall-Jackson, Louis Martini, Paul Hobbs, Robert Mondavi, Signorello, Sterling and Stag’s Leap. There are also two Oregon wineries and two from Washington, including Chateau Ste. Michelle. Others: There are also Spanish, Portuguese and New Zealand wineries, along with one each from South Africa and Mexico. Tawse Winery: This Ontario winery is making its first appearance at the festival. It is the only Ontario winery here – but it is arguably the best Canadian winery. Tawse won the Canadian winery of the year award in each of the last two Canadian Wine Awards competitions. The winery was opened in 2005 by Moray Tawse, a Toronto financial executive. Located on the Jordan Bench, the winery is designed for the ultimate in gravity-flow processing. The investment in the winery is substantial. I once asked Tawse how much he was spending on the winery. He replied: “I won’t tell you but I can say that it will never make money.” I think he was joking. This will be a rare chance to taste and buy the stunning Riesling, Chardonnays and Pinot Noirs from this winery. Sake: There will be four producers of sake, or rice wine – two from Japan, one from Oregon and Granville Island’s Artisan SakeMaker. This is not the first time that there has been a contingent of sake producers at the festival. Sake producers first applied five or six years ago. I was then the chair of the selection committee. Over the festival’s more than 30 years, it was the unwritten policy to exclude producers of non-grape beverages, such as fruit wines, as well as distilled spirits. Since as many as 300 wineries apply each year for the 185 tables in the tasting room, it was generally agreed that there were no tables to spare for the non-grape crowd. The sake producers, however, were seen as a refreshing change from same old/same old. Once the seven-member selection committee made sure that the festival’s board of directors were on side as well, an area on the tasting room floor was set aside for sake. And it proved to be very popular. It should draw crowds again this year. Japanese-born Masa Shiroki, who opened Artisan SakeMaker in 2007 on Granville Island, will be releasing what is a breakthrough product – sparkling sake made by the traditional bottle-fermented Champagne method. He is only releasing 240 bottles, priced at $50 a bottle. He will be pouring it at his stand and it will also be on sale at the festival wine store. Don’t miss it. Everyone has his own defence against a cellar palate. A month on a BMW motorcycle in South America is the self-prescribed cure for David Enns, the winemaker and co-owner of Laughing Stock Vineyards. “I just spent 30 days in South America, drinking a lot of really bad wine,” he says. To be fair, he also found some really good wine, amid the profusion of $5 - $8 wines. Now he is turning his clear head and fresh palate to one of the winery’s most important tasks each year: blending the winery’s 2010 reds, including Portfolio, Laughing Stock’s flagship Bordeaux-style wine. Since the first vintage in 2003, Portfolio has become one of British Columbia’s icon reds. Laughing Stock makes between 3,000 and 3,400 cases of red wine each year, including about 2,000 cases of Portfolio. Each year the winery offers “futures” on Portfolio, usually selling between 500 and 700 cases. This year, the futures offering is open on the winery’s website for just one month, until the end of February. In a futures offering, buyers of the wine are asked to order and pay for wine that is not even bottled yet, for delivery in about 10 months. In exchange for taking a chance on the future, the buyers get a reasonable discount. Portfolio will retail at $42 a bottle on release next October. But if you buy the futures offering now, you pay $35 a bottle. The futures price has not risen in eight vintages. The five varietals that will be blended into Portfolio 2010 are still in French oak barrels. During the next two to four weeks, David will taste each barrel and put together various blends before deciding on the final blend for the wine. The barrels that don’t quite make the cut for Portfolio typically end up the winery’s lower-priced, but still delicious, Blind Trust blend. While David blends to an established taste profile, Portfolio blend varies a bit, depending on which varieties are strong in any given vintage. Over the years, Merlot has dominated the blend – but not always. Portfolio 2009 is a blend of 36% Merlot, 27% Cabernet Sauvignon, 22% Cabernet Franc, 14% Malbec and 1% Petit Verdot. Portfolio 2008 is 53% Merlot, 24% Cabernet Sauvignon, 12% Cabernet Franc, 9% Malbec and 2% Petit Verdot. Blind Trust 2010 will be bottled in April and released in June. The final Portfolio blend, however, is returned to barrels for another three months before being bottled. The wine also gets several months of bottle age before it is finally released. So why put money down for a wine that is not even blended? Because David Enns and Laughing Stock have established a solid track record with successive vintages of Portfolio. “I think we are working hard at Laughing Stock to do that consistently year in and year out,” he says. 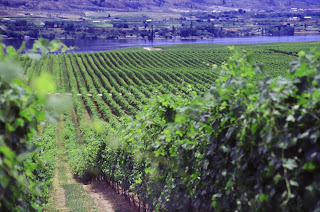 The vintages in the Okanagan, until 2010 and 2011, have given winemakers big, ripe fruit to work with. David believes that consumers will notice a difference in the two most recent vintages because both were cooler that any vintage since 1999. “One thing with the 2010 vintage, and I think it will be a repeat in 2011 reds, is that the wines are going to be lighter and much more elegant, without the heavy mouthfeel viscosity associated with the previous five years,” he says. Like many other Okanagan winemakers, he thinks the 2010 and 2011 Okanagan reds will have more in common with Bordeaux than with California. They will be wines with slightly lower alcohol, slightly higher acidity and – in the hands of a skilful blender – with bright fruit flavours and elegant balance. And they will age well. LaStella and Le Vieux Pin, two wineries owned by Enotecca Winery and Resorts of Vancouver, are among the handful of Okanagan wineries to export wines. Both are comparatively small producers (each makes about 4,000 cases a year). However, both produce a range of small-lot premium wines priced for discriminating collectors and restaurateurs. The prices can be justified by the quality of the wines and by what has been done to produce that quality. Many of the reds are from vineyards cropped at two tons an acre, or about half the usual yield. That makes for intensely flavoured wines that have to sell at a premium just to make the vineyard economics work. Currently, wines from these producers are available in Hong Kong, Tokyo, Los Angeles, Germany and Switzerland, among other markets. For example, some of the wines have been purchased by private collectors in Hamburg and by a pair of Michelin-starred restaurants there. In Zurich, the wineries have both retail and restaurant distribution. These are buyers that are used to paying premium prices for premium wines. After all, the same markets scramble every year for Bordeaux wines that are priced more on the prestige of the vineyards than on the cost of making the wines. I don’t know how profitable it is to ship a pallet of wine to, say, Switzerland. But I do know that it validates British Columbia wines – as if they still need validation – to be on wine lists and in cellars with the classified growths. For those at home who already collect LaStella and LVP wines, they should realize that they are now competing with overseas collectors; perhaps they need to place their orders more promptly than before the world really learns about these wines. 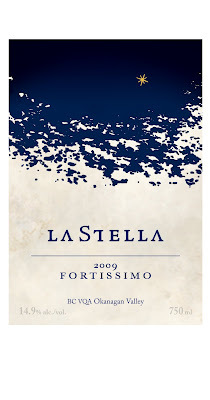 Both LaStella and LVP (and many other Okanagan wineries) have established wine clubs. Membership usually requires regular purchases. The benefit of these clubs is that their members are first in line when new wines are released – even ahead of the collectors in Hamburg! Both wineries are just about to release a number of new wines, includes reds from the terrific 2009 vintage. Here are notes on wines that you may want to get in line for. 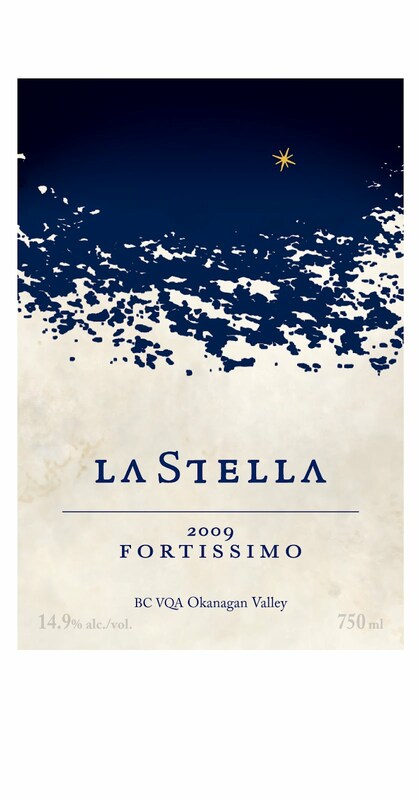 LaStella Fortissimo 2009 ($35 for 367 cases). This is a blend off 67% Merlot, 20% Cabernet Sauvignon, 5% Cabernet Franc and, with a touch of Tuscany, 8% Sangiovese. This is a bold red with an appealing aroma of black currants and with brambly flavours of currants, plums and black berries. There is a lovely core of sweet fruit on the palate supported by ripe tannins. 90. The barrels in which this wine was aged include large-format oak puncheons in order to minimize the oak flavours while getting the benefit of barrel aging. “Wine is like a painting,” says Rasoul Salehi, the executive director of the Enotecca wineries. “If you have a beautiful picture, you don’t want to distract from it with a big frame.” He also quotes an Italian winemaker who compares oak to a surgeon’s scalpel. The doctor needs the scalpel for surgery but he takes care not to leave it in the patient. So you can take it from those bits of wisdom that you won’t get over-oaked wines from either of these sister wineries. Le Vieux Pin Retouche 2009 ($N.A. for 62 cases). This wine, to be released in the fall of 2012, revisits a once traditional Bordeaux practice called “hermitaging” which involved blending some Rhône reds into the Bordeaux wine. This blend is about 70% Cabernet Sauvignon and 30% Syrah. Care was taken in the blending not to submerge the Cabernet Sauvignon’s characteristics. There still is a touch of bell pepper in the aroma of spicy red berries. The texture is fleshy, with flavours of plum, fig and a hint of tobacco. 91. Le Vieux Pin Syrah 2009 ($40 for a production of 975 cases). Made with fruit from three south Okanagan vineyards, this wine begins with an appealing red fruit aroma. On the palate, there are flavours of plum and black cherry with spice and white pepper on the finish. The tannins are round and ripe. 91. Le Vieux Pin Équinoxe Syrah 2009 ($70 for 160 cases). With 14.8% alcohol, this is a ripe red made from grapes grown around 1.5 tons an acre. It starts with an intriguing aroma of red liquorice, pepper and raw steak. On palate, there are generous flavours of plums, black cherries and red liquorice. The texture is full, rich and elegant. 95. Le Vieux Pin Ava 2010 ($35 for 253 cases). In a tradition of this winery of naming wines for employees’ children, this white blend is named for winemaker Severine Pinte’s daughter. The wine is a blend of 70% Viognier with Roussanne and Marsanne. This is a big basket of fruit flavours – apricot, melon and citrus. The balance is such that wine manages to be both fleshy in texture and refreshing and dry on the very long finish. 92. Some Okanagan wineries need to work a little harder to raise the winery’s profile. One winery that realized that is Mt. Boucherie Estate Winery of West Kelowna which, during the past six months, has had its owners, its winemaker and its agent doing tastings in the Vancouver market. 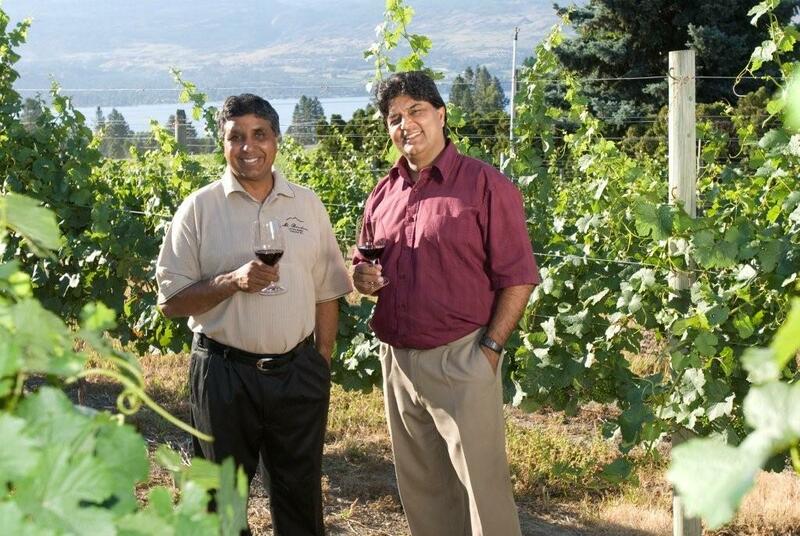 The winery, which opened in 2001, is owned by Kaldep and Nirmal Gidda (and their wives). It has an extensive portfolio of 22 wines, including three Icewines. The winery currently produces about 20,000 cases of wine a year. I believe it may produce wine for one or two other wineries as well as sell some grapes. The Gidda brothers own about three hundred acres of vineyard in three areas – West Kelowna, Okanagan Falls and the Similkameen Valley. Jim Faulkner, their winemaker, gets to work with as broad a selection of varietals as any Okanagan winemaker. The table wines are released in three tiers. The budget-priced Estate tier and the mid-priced Summit Reserve tier comprise most of the portfolio. Small runs of wines that are deemed rare and special, and therefore are a little pricier, are released as Family Reserve. During visits to the winery over the years, I have tasted all of the tiers, forming good impressions. Everything here is reliable. Especially notable in the estate tier is the Gewürztraminer, the Riesling, the Sémillon and (see review below) the Pinot Gris. My only quarrel is that the winery uses synthetic stoppers for wines that might be better served with screw cap closures. Among the Summit Reserve range, I have often recommended the Pinot Noir as excellent value at $20 a bottle. The Chardonnay, at $25, is a sophisticated example of that variety. Recently, half a dozen Mt. Boucherie wines – two examples from each tier – arrived for review. Here are notes on those wines. Mt. Boucherie Estate Pinot Gris 2010 ($14.99). This is the tropical fruit basket style of Pinot Gris, with tangy flavours and aromas of lime and grapefruit. The texture is ripe and fleshy and the finish goes on and on. 89. Mt. Boucherie Estate Gamay Noir 2010 ($14.99). A light-bodied unoaked red recalling Beaujolais, this has aromas and flavours pepper, cherries and cranberries. 87. Mt. Boucherie Summit Reserve Merlot 2008 ($24.99). This wine begins with an appealing aroma of black currants, pomegranate and vanilla. On the palate, the concentrated texture has acquired the polish that comes from a few years in the bottle. The flavours include black currants, blackberries and mocha. 90. Mt. Boucherie Summit Reserve Syrah 2007 ($24.99). The wine begins with aromas of pepper and black cherry. The wine has a generous palate-coating texture, with flavours of black cherry and fig and with black liquorice on the finish. 90. Mt. Boucherie Family Reserve Pinot Noir 2006 ($29.99 for 150 cases). Now fully mature, this wine spent 20 months in barrel followed by maturation in bottle. It begins with aromas of spice (cinnamon) and cherry and has savoury, herbal flavours. The texture is classic Pinot Noir – silky and fleshy. 88. Mt. Boucherie Family Reserve Zinfandel 2008 ($34.99 for a production of 100 cases). This is one of just three or four wineries that release Zinfandel from grapes grown in B.C. The Zins from the Okanagan and Similkameen all have lively, brambly fruit and aromas. This wine tastes of blackberries and raspberries laid over notes of vanilla and coconut. The wine aged 24 months in French oak. The spicy finish lingers. 90. 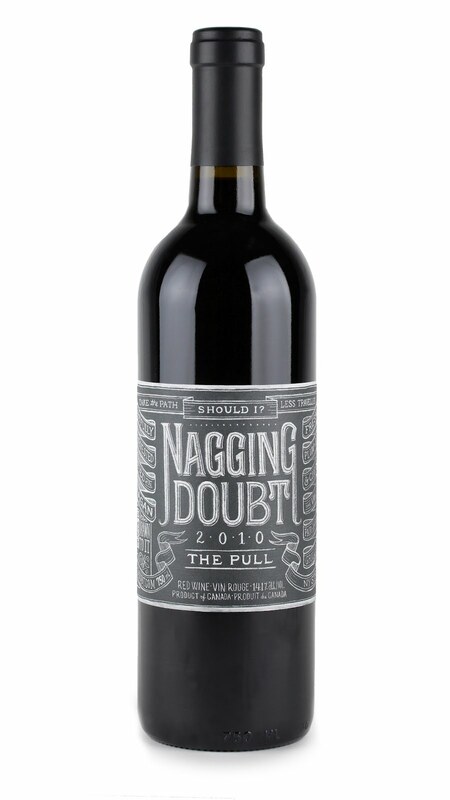 Branding guru Bernie Hadley-Beauregard may have hit another home run with his clever label for Nagging Doubt Wines. Last summer, the label for Nagging Doubt’s Viognier 2010 won double gold at that San Francisco International Wine Competition. This was by no means the only one of Hadley-Beauregard’s clients to garner label awards there. The website for Brandever Design, his company, has an impressive list of awards that his client wineries won last year at that competition. What sets Nagging Doubt apart is that is a new British Columbia winery that is just now releasing its wines – just two so far, totally 138 cases from the 2010 vintage. That recognition in San Francisco certainly puts wind in the winery’s sails, and likely in its sales as well. The Nagging Doubt brand is owned by Vancouver businessman Rob Westbury, 43, a human resources consultant, and his wife, Abbey. Rob’s winemaker and wine business coach is Mark Simpson, who recently has also introduced his own label, Siren’s Call, to the Vancouver market. Both brands are made and sold under the license of Alto Wine Group of Okanagan Falls, a winery incubator in which Mark is a partner. The Nagging Doubt wines have begun to appear in Vancouver restaurants as quickly as Rob can get around to staging tastings with sommeliers. As he establishes a foothold in the market, he will follow up with 500 cases of wine from the 2011 vintage, beginning with 150 cases of Chardonnay this spring. He won’t make a living, of course, until Nagging Doubt is established and is offering a higher volume of production. Rob’s in no rush. He is not one those who is getting into the wine business to escape a day job. He also enjoys his professional business career. He has shown considerable business acumen in launching Nagging Doubt, starting with retaining Brandever to counsel on brand strategy. Brandever’s previous well-known home runs include Blasted Church, Dirty Laundry and Laughing Stock. For label design, Bernie recommended a New York artist, Dana Tanamachi, who works in chalk. The slate-coloured labels emerged that have the look of a chalkboard because that was where they were drawn in the first place. The labels, packed with information, stand out when a bottle shows up on a restaurant table. But what makes them really clever, and probably explains why Nagging Doubt won double gold, is that the labels are interactive. If you focus your smart phone onto the QR (quick response) code on the label, you are taken to a website video of the artist creating the label. It is a novel experience to sit there with a glass of wine while watching that wine’s label come to life. That cleverness will sell the first bottle. What is in those bottles certainly should erase any consumer’s “nagging doubt” about buying subsequent bottles of the wines. The future strategy is being built on sourcing grapes in the Okanagan under contractual or leasing arrangements, and eventually acquiring some property. Making the wines at Alto Wines relieves Rob of the need to invest a lot of money in the wine project now, before he has money to invest. Here are notes on the two wines currently in the market or available through the Nagging Doubt website. 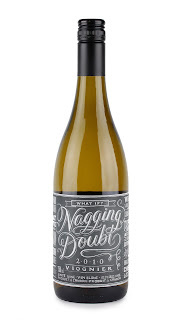 Nagging Doubt Viognier 2010 ($23.99). 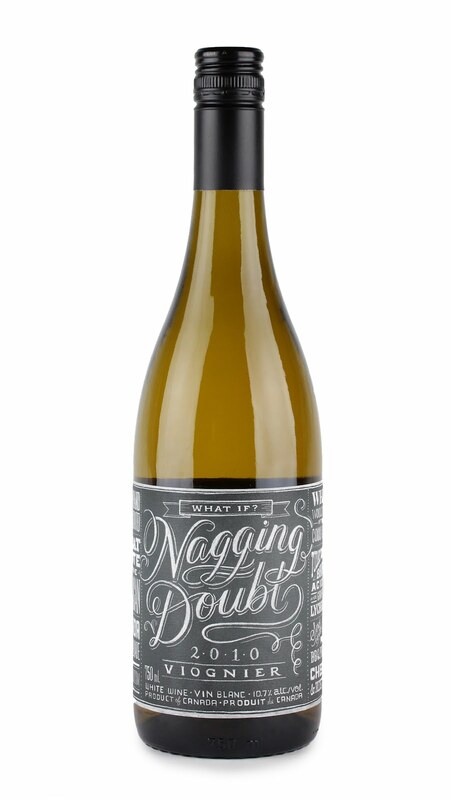 This varietal is a one-off for Nagging Doubt, which will switch to Chardonnay for its next white release. In 2010 Mark and Rob came across some Viognier that was too good to walk away from. This wine is crisp and tangy, with citrus and herbal aromas and flavours. The alcohol is only 10.7% but this is not an unripe Viognier. It is well balanced and refreshing and is the sort of white that calls for a plate of oysters. 90. Nagging Doubt The Pull 2010 ($29.90). This is a blend of 44% Merlot, 25% Cabernet Sauvignon, 15% Cabernet Franc, and 8% each of Petit Verdot and Malbec. The concept behind the name is that “the pull” of wine overcame Rob’s nagging doubts about getting into the business. This wine, while youthful, is drinking well already but will cellar well for several years. It begins with vibrant aromas of cherry and other red berries with a hint of mocha. That probably reflects the barrel aging; but Mark and Rob use oak subtly and lightly, so as not to submerge the spicy cherry and blackberry flavours. Rob says that Saint-Émilion is the template for the style of this elegant red. 90. Siren’s Call, which is just releasing five Okanagan red wines from the 2010 vintage, is one of the newest British Columbia wine labels. The winemaker behind the label is Mark Simpson, the principal of Vancouver-based Artisan Food & Beverage Corp., a consulting company he set up in 2007. In 2010, he decided to create his own wine label partly to establish his bona fides as a consulting winemaker. He became a partner in Alto Wine Group, a custom crush winery at Okanagan Falls, a strategic relationship that directed him to some very fine vineyards. The result is an impressive quintet of reds and a very good start for a new label – especially from someone who started as a beer maker (and still makes beers). Born in England in 1960, Mark came to Canada with his parents when he was one. His beverage career was launched in 1982 with the Molson Breweries after he has earned a microbiology degree at the University of British Columbia. In 1992 he became the brewmaster for the Granville Island Brewing Company in Vancouver, developing such popular beers as Cypress Honey Lager. 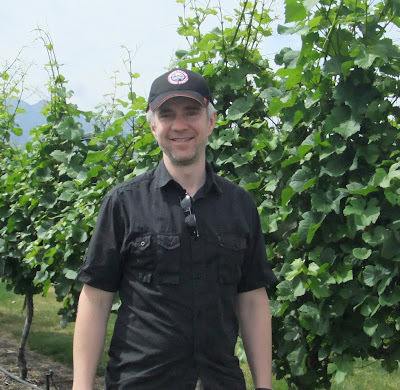 With the launch of Artisan, he also took on management assignments as well as production, with clients such as Saturna Island Estate Winery and The Fort Wine Co. He has several current winemaking clients include another new label, Nagging Doubt Wines, owned by a Vancouver businessman, Robert Westbury. Mark concluded he needed to launch his own label to raise his profile as a winemaker. The portfolio begins with Siren’s Call Pinot Noir 2010 ($24.90), a three-clone Pinot Noir from a Summerland vineyard. Mark says he set out to make a Pinot Noir “with some bottom to it.” That is a good description for this dark, robust and almost meaty wine. It begins with aromas of black cherry and has flavours of black cherry and vanilla, with a lingering spicy finish. 88. Siren’s Call Merlot 2010 ($26.90) is from a sunbathed south Okanagan vineyard managed by Terry Meyer-Stone and Andrew Stone. It begins with an impressively deep colour and aromas and flavours of blueberry, black currant and plum. The long, ripe tannins contributed to polished elegance of the texture. 90. Siren’s Call Malbec 2010 ($26.90). This red has a swaggering personality, with peppery aromas and flavours that wake up the palate. In his notes on the wine, Mark speaks of pencil lead and spice. I would not disagree but I also found cherries and plums and a peppery finish. 91. Siren’s Call Petit Verdot 2010 ($26.90). With 14.9% alcohol, this is a ripe, muscular red, beginning with aromas of mulberry, blackberry and spicy plums. Full-bodied and with great fruit concentration, it tastes of black currants, plums, figs and spice with a hint of tobacco on the finish. 91. Because the last two months have been incredible busy at my desk, notes on interesting wines have begun to pile up. You might ask what have I been doing that is more important than drinking wine. To begin with, I have completed a revised fourth edition of John Schreiner's Okanagan Wine Tour Guide for release in the spring. The number of new wineries in the past two years is amazing, requiring a good deal of new research. Now that the book is locked down in final design, I have already found some new producers. They will have to wait for the fifth edition or the e-book. I have in fact been tasting steadily and making notes until such time as I have a window for blogging again. Some of the wines reviewed here are limited production wines. The wineries may have begun to sell out but that does not mean you can't find the wines in private stores and on restaurant lists. I hope these notes will be helpful. Here are wines tasted in the last two months. CedarCreek Platinum Pinot Noir 2008 ($39.90). CedarCreek's style with Pinot Noir over the decade has produced wines that can be firm and closed when first opened. This wine, which spent 16 months in French oak, was deliberately decanted to help it open up. That liberated lovely aromas of strawberry and cherry. On the palate, there are flavours of raspberry and cherry, with a hint of cloves and mocha on the finish. 88. CedarCreek Platinum Chardonnay 2009 ($29.90 for 508 cases). Here is a subtle and polished Chardonnay with very subtle oak framing the citrus aromas and flavours. The wine was barrel-fermented and spent just 10 months in what tastes like very good French oak, lightly toasted. The wine has flavours of lime, lemon and apples, with refreshing acidity. 92. CedarCreek Merlot 2008 ($19.99 for a production of 4,658 cases). This brand is bigger than many Okanagan wineries! A few years ago, CedarCreek eliminated a mid-tier price range of wines to reduce its portfolio either to top of the line Platinum wines or good value estate wines, produced in enough volume that you can buy them year round. This is a typical Okanagan Merlot, juicy with hints of blackcurrant jam on the palate and with a spicy finish. 88. Ganton & Larsen Prospect Winery Red Willow Shiraz 2008 ($15.99). If you have been a fan of the popular Australian Shirazes at this price point, you will like this accessible wine. A generous red with flavours of plum, black cherry, blackberry and white pepper, this has a core of sweet fruit but is not as sweet as the Aussie competitors. 88. Ganton & Larsen Prospect Winery Regatta #1 Red 2009 ($14.99). This interesting red blend extends the excellent budget portfolio of this producer. This wine is 63% Cabernet Sauvignon, supported by Petit Verdot, Merlot, Cabernet Franc and a dash of Syrah. The Cabernet contributes a touch of bell pepper to an otherwise ripe and juicy red,with plum and cherry flavours. 88. Hester Creek Pinot Blanc 2010 ($15.99). Pinot Blanc has been (and may still be) the largest block of white grapes in the Hester Creek vineyard. It is always one of the winery’s most reliable whites. This is a lovely mouthful of fruit – like biting into a fresh Gala apple. The minerality in the backbone reflects the maturity of the wines without taking away from the juicy, delicious flavours. 90.
class="MsoNormal"> Hester Creek Character Red 2010 ($19.99). This is the winery’s second vintage of its Character blend and it is ever bit as good, and good value, as the first. It is a blend of Syrah, Petit Verdot, Merlot and Malbec. The Syrah delivers the aromas and flavours of dark fruits, leather, earth and chocolate. This swaggering red has, dare I say it, lots of character! 90. Herder Estate Chardonnay 2009 ($35 for a production of 109 cases). Remember that Lawrence Herder started making wine in California and you will understand the style. One critic at a recent lunch suggested that the oak was a little bold; Lawrence, to his credit, stood his ground and said that was the way he wanted to make the wine. This is a big rich creamy Chardonnay, with generous tangerine flavours nestled in the barrel notes. There is also an intriguing hint of white pepper on mid-palate, probably echoing some of the minerality of the site here. 90. Herder Estate Pinot Noir 2009 ($35 for a production of 68 cases). This wine establishes Herder as another top Pinot Noir producer in British Columbia. The wine presents with the lovely hue of a finely cut ruby. It has aromas and flavours of strawberry and raspberry, with a seductive and silky texture and a very long finish. 91. Jackson-Triggs Gold Series Chardonnay 2009 ($17.99 ). Don't make the mistake of serving this wine too chilled. It shows its toasty/citrus/tangerine aromas and flavours best when moderately chilled. 88. Jackson-Triggs SunRock Shiraz 2008 ($34.99). SunRock is the name of one of the winery's best vineyards in the south Okanagan. It is a hot site that grows great Shiraz; the winery has garnered awards internationally for this wine. This vintage begins with aromas of plum, spice, leather and even earth (that's meant to be positive). The wine is generous on the palate, with flavours of plum, fig, black cherry, spice and leather; there is liquorice on the finish. The wine has soft ripe tannins but will cellar well for a few more years. 90. Mission Hill Pinot Noir Reserve 2010 ($24.99). During the past several years, Mission Hill has quietly but successfully raised the bar on its Pinot Noir, having mastered most other varieties. This is a robust wine with aromas and flavours of cherry and raspberry, with spice on the finish and with the classic silky texture of the variety. 90. Mission Hill Chardonnay Reserve 2010 ($19.99). Here is a textbook example of oak need only be a grace note if the objective is to make a fruit-forward Chardonnay. Only 45% of the wine in this blend was aged in oak, and then just four months. The wine begins with aromas of citrus and butter, with a hint of toast. On the rich, creamy palate, there are flavours of pineapple, apple, citrus and hazelnut. The finish is clean and crisp. 90. Peller Private Reserve Syrah 2009 ($20). Here is a muscular wine with 14.9% alcohol but with so much substance that it does not have a hot finish. It has leathery, smoky aromas and flavours of figs, dark chocolate and pepper, with a gamey, earthy finish. 89. Nk’Mip Qwam Qwmt Syrah 2008 ($34.99 for a production of 1,216 cases). This is a bold and satisfying red, with aromas of the spice and pepper of delicatessen meats, and with flavours cherry, blackberry and vanilla. Full and rich on this finish, there is a delicious wine. 91. Nichol Vineyard 9 Mile Red 2009 ($27 for 108 cases). This is a cheerful blend of quite complementary varieties - St. Laurent, a red grown mostly in Austria - and Pinot Noir. The winery used to release the St. Laurent on its own. This is a more interesting blend, a little more robust that Pinot Noir but with all the charm of that variety. 89. Nichol Vineyard Syrah 2009 ($35). Nichol was the first to plant Syrah in the Okanagan in 1990, making a reputation both for itself and for the variety. With just 12% alcohol, this release is not as powerful as some Okanagan Syrahs but it makes up for that with elegance. It has lovely aromas and flavours of black cherry, pepper, spice, liquorice and deli meats. 91. See Ya Later Ranch Rover 2009 ($24.99). This Syrah is one of several wines from this winery named for the dogs that an early owner of the property owned (and buried under on-site headstones). The wine begins with aromas of plum, cherry and pepper. It is full-bodied, tasting of plum, fig, blackberry and chocolate. 89. Sumac Ridge Private Reserve Gewurztraminer 2010 ($14.99). 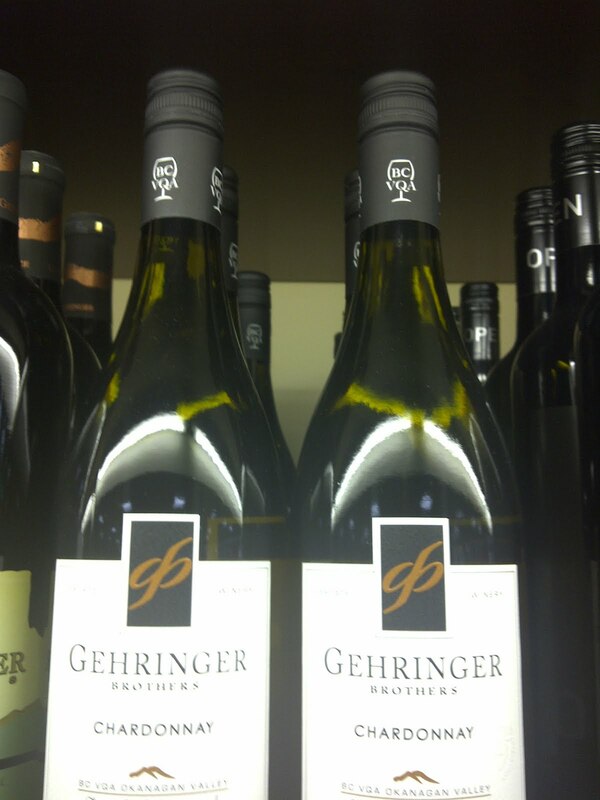 This is believed to be the largest selling Canadian Gewurztraminer, and has been so for a long time. It has the classic spicy aromas and grapefruit flavours of the variety, with a defining note of Muscat bitterness on the finish. 89. Sumac Ridge Steller's Jay Brut 2007 ($26.99). If you did not have this on New Year's Eve, get a bottle for Valentine's Day. This is as fine a vintage as the winery has yet released, with notes of toast and yeast on the nose (classic Champagne! ), with delicious fruity flavours and a creamy texture. The bubbles create an active and long-lasting display. The finish is clean and dry. 91. Terravista Figaro 2010 ($24 and available at Marquis Wine Cellars in Vancouiver). This Rhône blend is the initial release from Terravista Vineyards, the new winery launched by Senka and Bob Tennant. It is a blend of Roussanne, Viognier and Marsanne. It begins with appealing aromas of melons, apples and apricots. On the palate, there are flavours of apples, citrus, honeydew and apricot, with a fine spine of minerals that helps give this sophisticated wine a crisp dry finish. 90. Township 7 Syrah 2009 ($24.99 for a production of 366 cases). This wine begins with typical spice and pepper aromas of an Okanagan Syrah. On the palate, there are flavours of cherry, plum, with the earthy leather notes one also sees in this variety. 88. Since October 2011, wineries in British Columbia have been prohibited from using the VQA medallion that has been on bottles and labels since 1990. 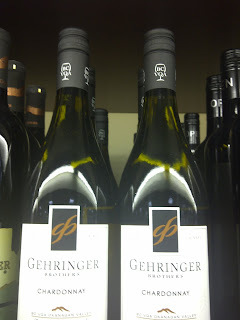 Instead, five letters - BC VQA - appear in small type on the labels. It is a little surprising that the Vintners Quality Alliance designation has become inconspicuous considering its contribution to the success of BC wines. Sales of VQA wines have risen from 600,000 litres in 1990 when the VQA program began to 7.8 million litres in 2010. The medallion directed consumers to those wines made from grapes grown in British Columbia, distinguishing them from the "cellared in Canada" wines made with imported bulk wines. As it is, the CIC wines grab $250 million in sales annually in BC, against $193 million in sales of VQA wines. It is debatable that BC wines would have anywhere near that market share without the VQA program. VQA was imported from Ontario in 1990, where it had been launched a few years earlier. Consumers interpreted the VQA symbol as an indicator of quality. In fact, the panels that taste wines submitted for VQA do not taste for quality. Their role is to screen out faulty wines. The current VQA assessment form lists only faults. Wines with technical faults are rejected; wines without faults are VQA-eligible. A mediocre wine can pass if it has no technical faults. Fortunately, most VQA wines are not mediocre. There is an explanation why consumers understood VQA to be a seal of quality. Before 1990, most BC wines were made with such inferior grapes that wineries had to add water and/or sugar at times to make palatable wines. Most of the inferior hybrid varieties were pulled out in 1988; and the rules for VQA winemaking forbade adding water or an unreasonable amount of sugar. The grape varieties remaining after the 1988 pull-out were almost entirely vinifera. At first, only wines made with vinifera were even eligible for VQA. As it happens, these were also better wine grapes. For example, the European Riesling grapes always made better wine that the Okanagan Riesling hybrid. The VQA wines tasted better because they were made with better grapes. Hence, consumers understood VQA to mean better quality. In the two decades since VQA was introduced, many acres of premium vinifera have been planted. At the same time, vineyard and winemaking practices have become vastly more professional, resulting in dramatic improvements in wine quality. That has reinforced the perception that VQA means quality. BC VQA wines can only be made from grapes grown in BC. The wide acceptance of VQA wines has allowed vineyards to flourish. Without VQA, I suspect wines from grapes grown here would have been crushed by the the volume of low-priced CIC wines because consumers would have had no simple way to identify local wines and support them. There are also many excellent wines from BC grapes that do have have the BC VQA symbol, since the program still is voluntary. But even the wineries not applying for VQA benefit from it because VQA created such broad acceptance of homegrown wines. So why has the symbol been banished? That decal belongs to VQA Canada (effectively, VQA Ontario). BC and Ontario have never been able to agree to the same national wine standards. Arguably, the BC wine standards are just as effective but because they are not the same, BC no longer is allowed to use VQA medallion. For the time being, BC wineries replaced it with the letters, BC VQA. The irony is that many wineries had stopped using the "stop sign" - as the VQA medallion is sometimes called. "Prior to the fall of last year, had you gone into a liquor store and aggressively searched for the medallion on any BC wine, you would have a hard time finding it," says Jeffrey Thomas, the chair of BC Wine Authority. "So far as we could determine, there were only three producers that continued to utilize the medallion. One of the major reasons that BC producers were no longer using it was that they didn’t like it. They thought it was ugly." As an interim symbol, wineries are allowed to use the wine glass symbol of the BC Wine Authority. "It looks reasonable as a temporary mark but the idea was never that we would eliminate the prominence of BC VQA on the bottle," Thomas says. The BCWA has commissioned the design of a new certification symbol. "We are in the process of developing some alternative designs that we can then present to the industry in consultations, to see if we could get some consensus as to what the replacement mark will be," Thomas says. That process is likely to last a year or so. "The added benefit to BC producers of adopting a different certification mark is that there then is a clearer distinction between BC and Ontario wines," he says. "Our view on the standards is that we have in fact moved to a higher standard."